Listen to some of Europe's top designers, academics & experts discussing the future of European design. 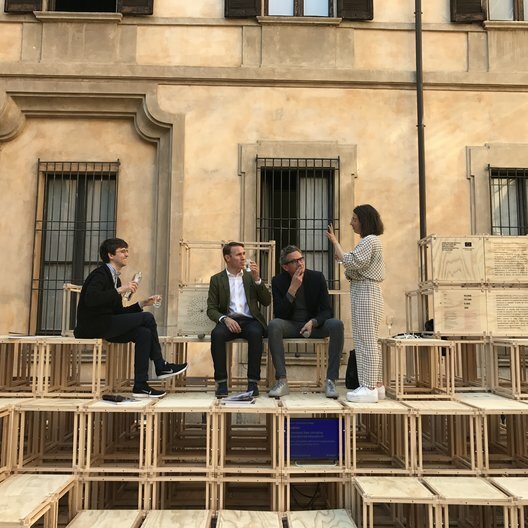 We worked with Disegno to produce a series of podcasts at this year's Salone del Mobile in Milan, exploring The Future of European Design. We invited an all-star lineup of design experts to Atelier Clerici, a neoclassical palazzo in central Milan to discuss international cooperation in the European design sector. Each talk explored a different facet of design: education, policy, and industry. We turned these conversations into podcasts which are available to listen to on the Disegno website. Are overseas fees corrosive to transnational education? This podcast recorded live in Milan on 4 April 2017 focuses on education. The discussion was chaired by Oli Stratford with Sebastian Bergne, Alexis Georgacopoulos, and Tamar Shafrir who discussed questions such as; 'Is it intuitive to prioritise British students in British Education?' and 'What impact does the rise of nationalism in Europe have on international design education?' Find out their answers by listening here. Can the European design industry survive a transition from free movement to protectionist values? Chaired by Johanna Agerman Ross with Jan Boelen, Ineke Hans, and Orhan Nikšić this podcast explored the effect of increasing nationalism in Europe on the global design industry. In this industry-focused discussion, the speakers explored nationhood, localism and globalisation in the wake of a changing political landscape. This podcast was recorded live on 4 April 2017 - Listen now at DisegnoDaily. Why aren't all economies circular? For the final podcast in the series, we were joined by Joseph Grima with Sarah Mann, Carl-Johan Skogh and Vera Sacchetti to discuss the Circular Economy. Listen to our amazing speakers ask critical questions circular economy such as 'Can we have a circular economy whilst we are still obsessed with economic growth?' Find out their answers at DisegnoDaily.